A classroom may not seem like the natural habitat for a self-professed “adrenaline junkie” like Austin Groesser, but he’ll be in one this fall. The firefighter and EMT is one of the first students in a new associate degree-paramedic program offered jointly by NMC and Munson Regional EMS. This semester he’s taking English, biology, and psychology while continuing to accrue work experience as an EMT. Once Groesser has two years of EMT experience, he’ll be eligible to enroll in Munson’s paramedic program. NMC will accept the coursework he completes in that program as transfer credit. And by September 2017, Groesser expects to earn both his associate’s degree and his paramedic license. “If I’m going to spend the time doing it, I’d much rather have a paper degree plus my license,” said the 2013 graduate of Traverse City West High School. Groesser, 19, said the versatility of the degree attracts him. 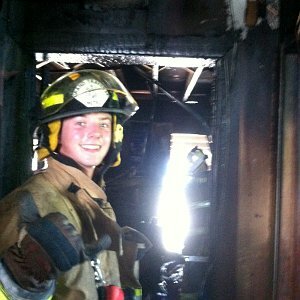 His career goal is to be a full-time firefighter, but departments want to hire individuals who can double as paramedics. “Fire medics are the future,” he said, adding that he’s drawn to both the adrenaline rush of the job and the potential to do good. “It’s a really powerful job. You can save lives,” he said. Daryl Case, manager of Regional EMS Education for Munson, said the degree is important in the context of a career lifetime. Rudy Rakan is completing the program in the opposite direction. He already has two years of EMT experience working for Munson and two different ground agencies, so he began the paramedic portion of the program in July. Also 19 and a Traverse City West High School graduate, Rakan expects to complete that in fall of 2016 and begin his NMC coursework in spring 2017. “When I found out they were offering the associate’s degree, I was excited because as a health care industry everything is pushing toward more education,” he said. Students could also flow to other NMC programs like nursing. “The student is the one who gains,” said Laura Schmidt, NMC’s director of nursing. NMC will also provide assessment testing for incoming students. NMC and Munson Regional EMS have partnered to offer an Associate in Applied Science Degree (AAS) with a Paramedic focus. All general education classes are offered at NMC. All paramedic classes are offered through Munson Regional EMS.